Breathtaking. 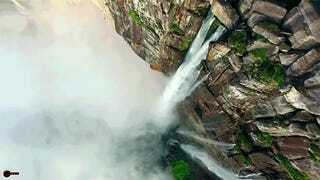 This drone footage of Angel Falls in Venezuela is exactly that. Angel Falls is the world’s highest uninterrupted waterfall at 3,212 feet tall and it is totally stunning to see the water make its way down the side of the mountain and disappear into the mystery below.